Freshly ground almond butter with a handful of fresh blueberries on a whole grain waffle is one of my favorite easy on-the-go breakfasts. I’m excited to partner with The National Milk Life Campaign to bring you this easy breakfast idea because a cold glass of organic milk pairs perfectly with this breakfast! My local supermarket has machines where you can grind your own peanut butter and almond butter right in the store with no added oil or salt. The almond butter is especially delicious spread on a multi-grain waffle, and I just love the combination of almonds and blueberries. It almost tastes like a healthy dessert for breakfast. If I’m in the mood for a change I’ll add strawberries, or mix it up with peanut butter and sliced bananas. This is one of my morning go-to’s because I can walk around with it while I’m trying to get the kiddos out the door, and I can even take it in the car with me on the way to school. 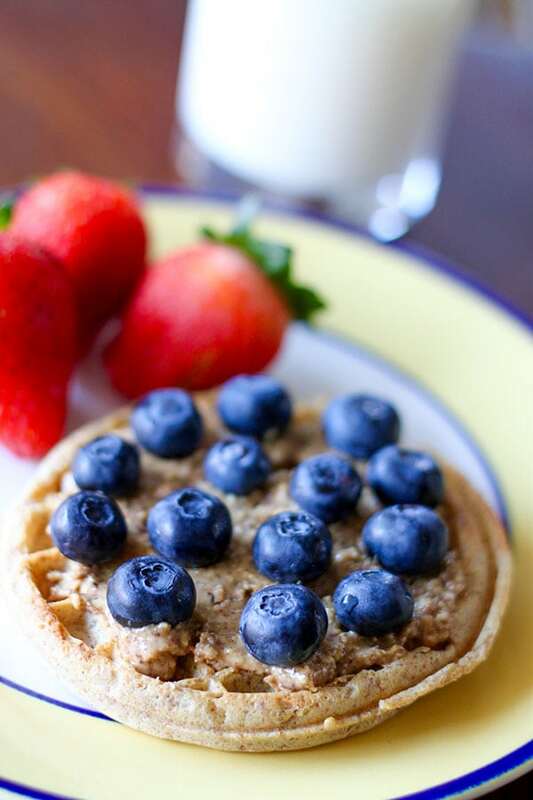 Pairing this almond butter blueberry waffle with a glass on organic milk and it’s high-quality protein is a delicious way to get a jump start on your morning protein. Starting your day with a protein-rich breakfast that includes organic milk and reaches the 25-30g of protein that many experts recommend getting before noon is a great way to stay energized throughout the morning. Getting 25-30g of protein before noon can make you feel full longer and keep you running through those busy mornings. Make sure you also have a high-protein mid-morning snack to reach the recommended 25-30g of protein before noon.